Q. I am considering adding more TimePilot clocks to my system and was wondering if it can handle employees clocking in at one location and clocking out at another. A. Absolutely. It doesn't matter which TimePilot clock is used. You can mix and match TimePilot clocks—Vetro, Extreme, Tap+, TimePilot PC and even our iPhone App—and employees can clock in or out at any of them without a problem. When you set up your clocks, you’ll give each a name; we suggest using its location as its name (for example, “South Entrance,” “Front Door,” or “Loading Dock”). When an employee clocks in or out at any clock, the employee’s name, time of clock-in/out and the name of the clock are sent to the TimePilot database. When you view the transactions in TimePilot Central, you’ll be able to see all the clock-ins and clock-outs as well as where they occurred. Q. Is there any way to set up my iButtons in TimePilot Central right at my PC without entering the serial number manually? Each iButton's number is extremely long and difficult to read. Before plugging the iButton Receptor into a USB port on your computer, install the driver software that will allow the device to work properly. You’ll find it on your TimePilot Software CD. Insert the CD into your CD/DVD drive, choose “Install TimePilot Software,” then “TimePilot Installation Menu” (not Installation Wizard). Choose “Blue Dot Receptor” from the list that appears and follow the instructions to install the driver. Plug the iButton Receptor into a USB port in your computer. The device will be recognized by Windows. Now set up your employees. On the "Add a Profile" screen, when you're asked for the employee's iButton number, click the “Get iButton Number” button. Then simply press the iButton into either one of the blue probes on the iButton Receptor. 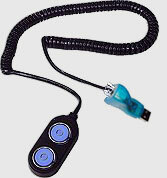 The device will read the number from the iButton and enter it in the software. Note: The iButton Receptor is not included with TimePilot PC, but if you want to increase your level of security, you can add the iButton Receptor to require your employees to use iButtons to clock in and clock out. For more on this topic, please click here. Q. Is there a way to set up employees so they can clock in about 7:15 a.m. but have their start time recorded as 7:30 a.m.? We’d like to do that, but we don’t want them to show up at 7:45 a.m. and have their clock-in rounded to 7:30. A. This situation is why we have the Snap-To feature. Many employees like to get to work early, settle in and not have to clock in exactly when their shift starts. The feature is extremely flexible: Snap-To can be used on clock-ins or clock-outs, before or after a shift start. The Snap-To setup screen is available when you create or edit a shift in TimePilot Central (Setup menu > Shift Setup… ). When you add or edit a shift, the Snap-To screen is the second tab across the top of the screen. Note: To use Snap-To, you’ll need to set up a shift, because otherwise there’s no start or end time for the software to snap to. Q. How do I check my iButtons to make sure they're working correctly? Tap the iButton to a timeclock station that's receiving power. The station does not need to be connected to a computer, nor does the iButton have to be set up on the system. If the timeclock emits a sound or any text appears on the LCD screen, the iButton is working correctly. For more on iButtons, visit this page on our web site. Q. I lost my TimePilot USB drive. I tried to use another USB drive, but it’s not working. What should I do? A. The USB drive you are using has not been configured for our system. To do so, go to Start > All Programs > TimePilot IV > TimePilot Utilities > TimePilot Support Utility. Select “Initialize USB Drive” and follow the instructions that appear. In a few seconds, it will be ready to use. Note: We can't guarantee that every manufacturer's USB drive will work with our products, but most will work without any problems. 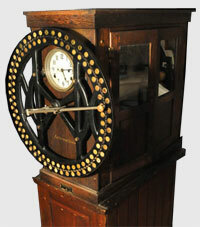 From timeclocks to ...: On Nov. 20, 1888, Williard L. Bundy, a jeweler, invented the first timeclock. A year later, he and his brother founded the Bundy Manufacturing Company in Binghamton, N.Y., and hired fewer than a dozen workers to build the clocks. Over the next 35 years, the company acquired other companies and merged with still others. In 1914 it hired Thomas Watson as its manager, and in 1924 Watson changed the company's name... to International Business Machines (known today as IBM). Yawn, drama, yawn, drama: Is your teenager a little more cranky than usual? A study by Rensselaer Polytechnic Institute found that later sunsets in spring—and the accompanying longer daylight hours—make it more difficult for teenagers to fall asleep early enough to be well-rested before school starts the following morning. The resulting sleep deprivation can cause mood changes, increased risk of obesity and possible underperformance at school. “As a general rule, teenagers should increase morning daylight exposure year round and decrease evening daylight exposure in the spring to help ensure they will get sufficient sleep before going to school,” said RPI Associate Professor Dr. Mariana Figueiro. TimePilot Q&A: Using various TimePilot clocks; setting up iButtons. TimePilot Best Practices: Handling employee work breaks. How do you handle employee breaks? Work breaks are generally considered paid time, and therefore employees do not have to clock out and then clock in. But there may be times when you want to monitor employees' breaks to ensure they aren't taking extra time, or even penalize employees who take longer breaks than they should. These functions are set up when you add or edit a shift schedule (in TimePilot Central: Setup menu > Shift Schedules...). Note: To use these functions, employees must clock out and then clock back in for their breaks. There are two levels available: Break Monitoring and Break Penalty. With Break Monitoring enabled, if an employee clocks out and back in within the number of minutes specified for their break time, the two transactions are recorded and labeled as breaks, which causes the software to ignore them when it calculates the employee's work hours. If the employee exceeds his or her break time, the transactions are recorded as normal out and in transactions, and the minutes are subtracted from the employee's work time. To use this function, click the checkbox in the Break Monitoring box and enter the number of minutes for your break. The TimePilot software records the employees' clock-outs and clock-ins, so you can see they took a 9-minute break. When the software calculates work hours, it will ignore the two break transactions because they occurred less than 10 minutes apart, effectively keeping the employees "on the clock" through their break period. The TimePilot software records the employees' clock-outs and clock-ins, so you can see they took 12 minutes instead of 10 in TimePilot Central. When the software calculates the employees' work hours, it will deduct 12 minutes from their time. To avoid having this time deducted, see the TimePilot Tip below. Enable Break Monitoring and set the time to the number of minutes of your break. Click the checkbox next to Break Penalty and enter the sum of the break time plus the number of minutes during which the employee would be penalized. Only the number of minutes he or she was late returning from break will be deducted from their work hours. If the employee exceeds his or her break time by more than the number of minutes you set, the transactions are recorded as normal out and in transactions. Employee No. 1 clocks out at 10 a.m. and back in at 10:09. The software records the transactions, but does not deduct the 9 minutes from the employee’s work time. Employee No. 2 clocks out for break at 10 a.m. but doesn’t clock back in until 10:15 (returning 5 minutes late). The software records the transactions, but because the number of minutes taken is within the 20-minute Break Penalty parameters, the software will deduct only 5 minutes from the employee’s work hours. Employee No. 3 clocks out for break at 10 a.m. but doesn’t clock back in until 10:25 (returning 15 minutes late). The software records the transactions; because the number of minutes taken is beyond the 20-minute Break Penalty parameters, the software will treat them as normal out and in transactions and deduct the full 25 minutes from their work time. Example, using the same situation as in the examples above. The TimePilot software records the employees' clock-ins and clock-outs, so you can see they took 12 minutes instead of 10. When the software calculates work hours, it will ignore the two break transactions because they occurred less than 20 minutes apart. someone does a search for “ice cream sundae” and for “ice cream cone.” Then you tell Google how much you’ll pay when someone clicks your ad and your maximum monthly budget.